Benerexa Marquez was born among the Arhuaco People in the SNSM (Sierra Nevada of Santa Marta), Colombia. 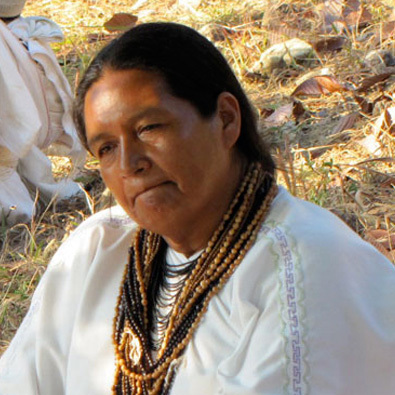 She is known for her work with Arhuaco women, working always under the guidance of the traditional Mamos. She formed the Guatijina Organization whose focus is to strengthen the role of women in the traditional practices while awakening an interest in the younger generation of Arhuaco women in assuming their traditional responsibilities through educational gatherings and workshops. Her career has been in Public Health. Originally trained as a nurse, most recently Benerexa has fought to institute more openness to traditional medicinal practices in governmental health policy while serving as head administrator of WINTUKWA EPS (Colombian National health provider for the Arhuaco nation). She has served as secretary of ONIC (National Organization of Indigenous pueblos of Colombia) and she is currently a representative of indigenous peoples in roundtable talks with the Colombian government regarding health issues.